After stopping Killer Shark’s group Green Lantern, Flash, and Black Canary go to get the new security system for their headquarters from Ted Kord. Meanwhile, Locus and Vandal Savage bring in T.O. Morrow as part of Locus’s plan to use the alien remains to create a new being, but the experiment fails. 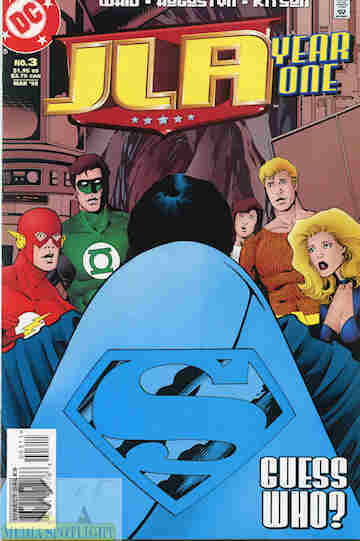 The last of the Appellaxians still in military care was sent back to the Justice League. The other begin to set-up shop and learn a bit about each other. They also set-up a table with chair Flash picked up with their symbols. One of those symbols is for Superman, who he considers asking to join the League. After some good-natured joking, one going too far, the team heads home, with J’onn concerned about the last Appellaxian. What they got right: Snapper Carr coming in as their mechanic and IT guy works for an origin for him. The heroes don’t quite bond but they kind of do when J’onn does his joke, and Aquaman chews Green Lantern out for his joke, which he apologizes for. You see them coming together rather nicely. What they got wrong: Well, I’m not sure what Locus’ end goal is but otherwise nothing. Recommendation: A good story so far. Hopefully it continues, but this is the most interesting issue thus far. Worth getting even on its own. Posted by ShadowWing Tronix on October 1, 2018 in DC Spotlight, Yesterday's Comics and tagged Aquaman, Barry Allen, Black Canary, DC Comics, DC Universe, Green Lantern, Hal Jordan, J'onn J'onzz, Justice League Of America, Locus, Martian Manhunter, T. O. Morrow, The Flash, Vandal Savage.